This is cost per nanosecond relative to a GTX-1080. 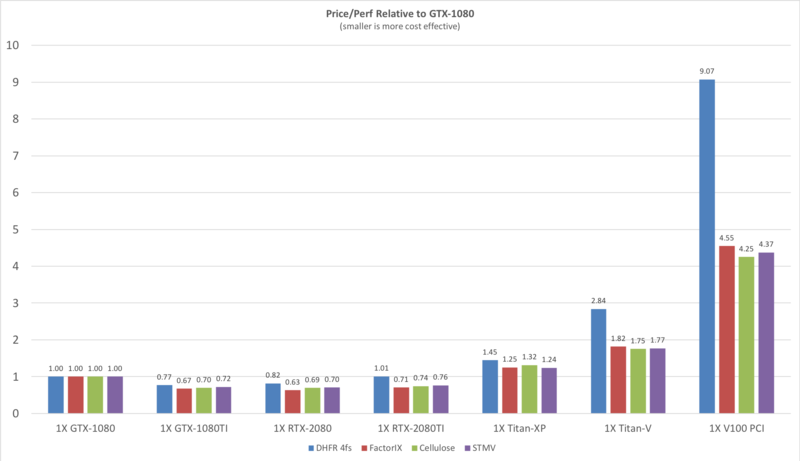 As of today the RTX-2080 offers the best performance per dollar. The other option if you favor raw performance would be the RTX-2080TI. This provides performance equivalent to, and in a lot of cases better than the V100s at a fraction of the cost. So you choice is really between the 2080 and 2080TI. Note do NOT buy the NVIDIA reference design cards, which have twin fans. The cooling is awful and there are even reports of people buying them for gaming seeing them catch fire. Make sure you get the single fan blower design. > I am replacing my four GeForce GTX 980 cards, what will the current standard GPU, that provides the best performance per money replacement ro run AMBER (1 run x node)? > I saw the benchmark, according to it would this be the Titan XP? Next message: Elvira Tarasova: "Re: [AMBER] reconstruction of pH-based trajectory files"
Previous message: Markowska: "Re: [AMBER] graph"
In reply to: Fabian Glaser: "[AMBER] GPU card for AMBER"
Next in thread: Fabian Glaser: "Re: [AMBER] GPU card for AMBER"
Reply: Fabian Glaser: "Re: [AMBER] GPU card for AMBER"